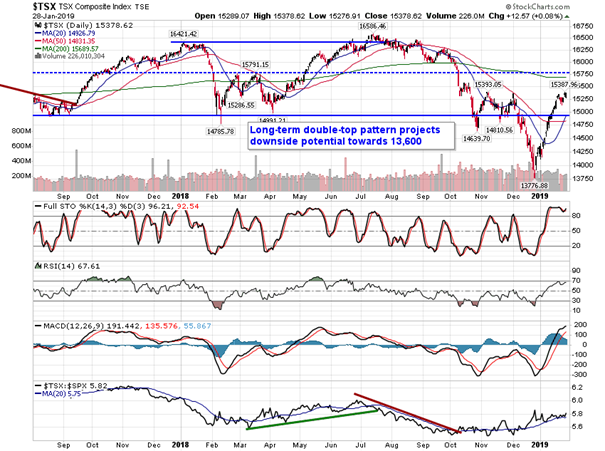 With a number of gaps around 2650, the S&P 500 Index is revealing an important pivot point. 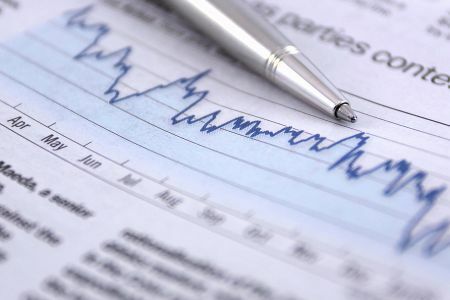 Stocks in the US traded lower on Monday following disappointing earnings from Caterpillar and Nvidia. 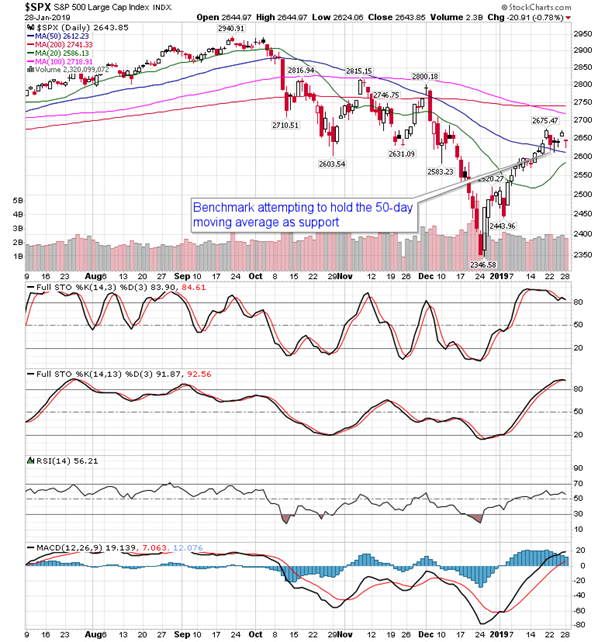 The S&P 500 Index shed 0.78%, ending well off of the lows of the day and remaining supported, for now, at its 50-day moving average. 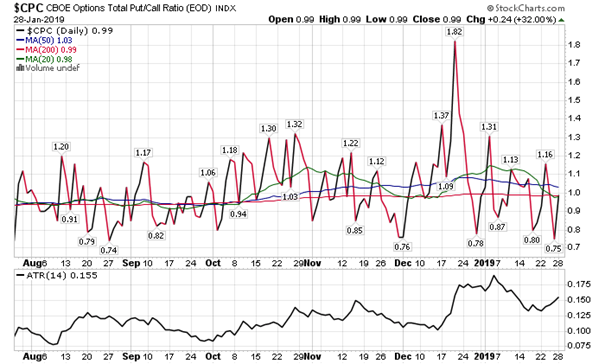 Momentum indicators on the daily look continue to roll over, but have yet to trigger sell signals. 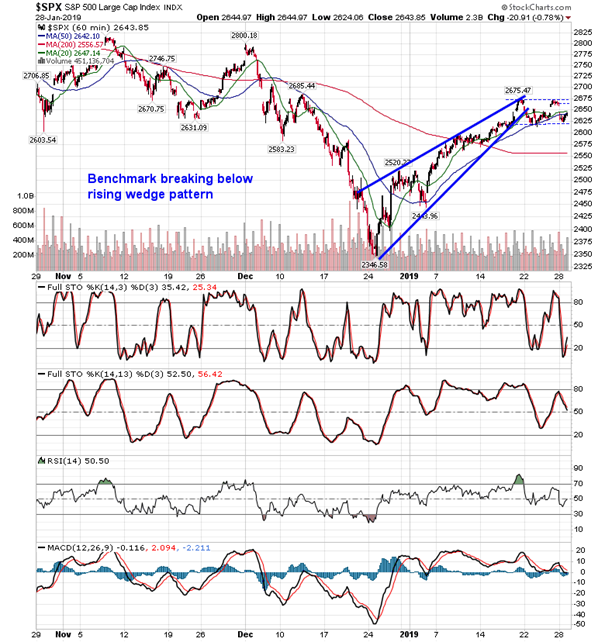 The market is in this massive range of congestion just above previous long-term support in the 2550 to 2630 zone, creating a battle between the bears and the bulls as each side attempts to gain control of the market ahead of month-end. 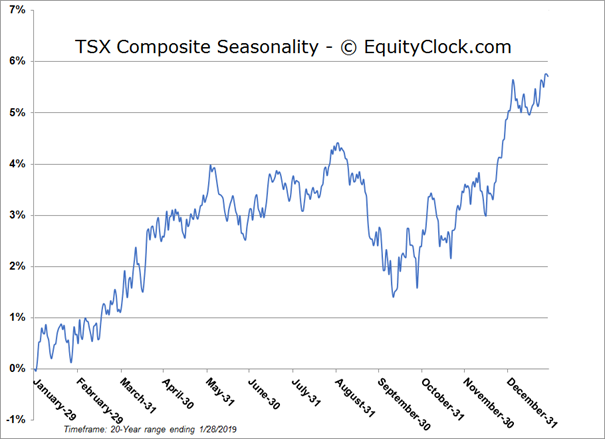 Turning to a shorter-term look, the large-cap benchmark broke below the lower limit of a rising wedge pattern last week, but it has yet to show anything that is outright bearish. 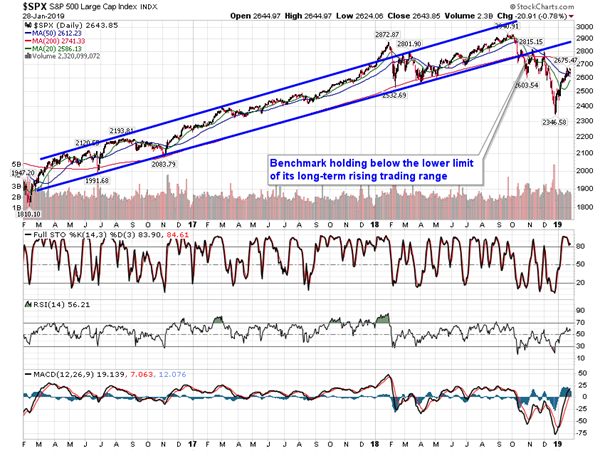 The benchmark has been consolidating within a tight range between 2625 and 2675. 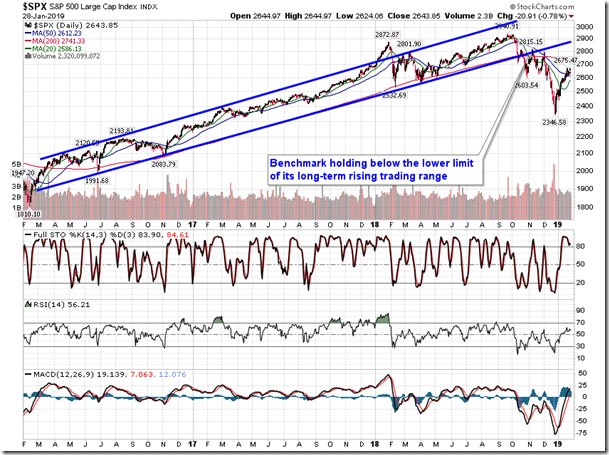 But the mid-point to that range is perhaps showing the most reaction with a number of gaps charted around 2650. 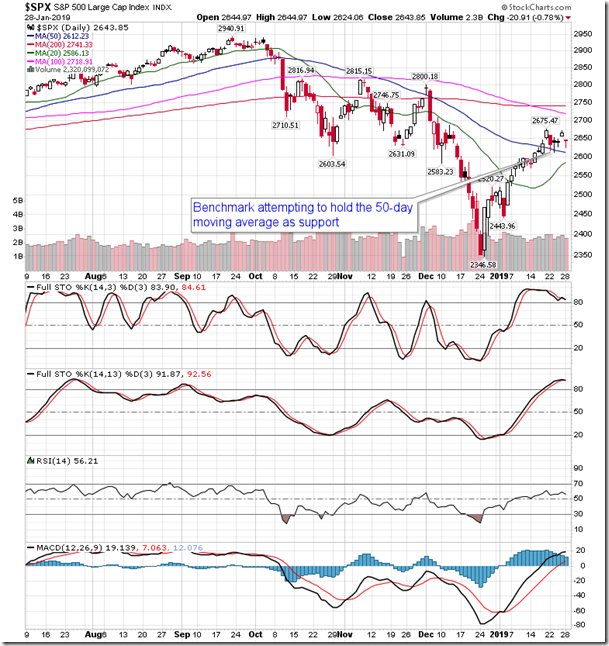 This is a highly important level that the market is responding to and is likely to provide the pivot for the next short-term move in stocks, depending on what the catalyst is to fuel the direction. Momentum indicators on the hourly look have been trending lower in recent days, suggesting waning buying pressures. 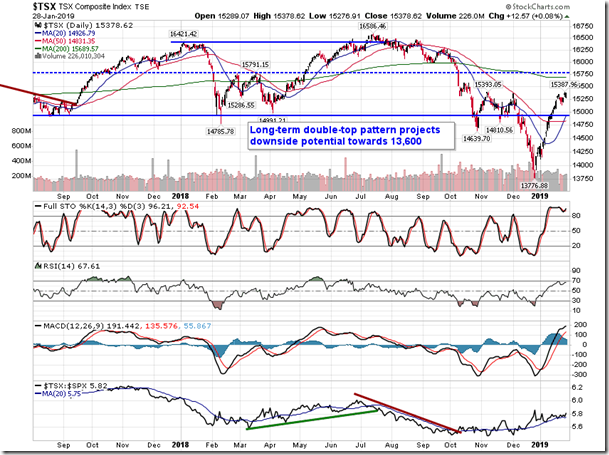 The characteristics of the indicators remain borderline bullish. 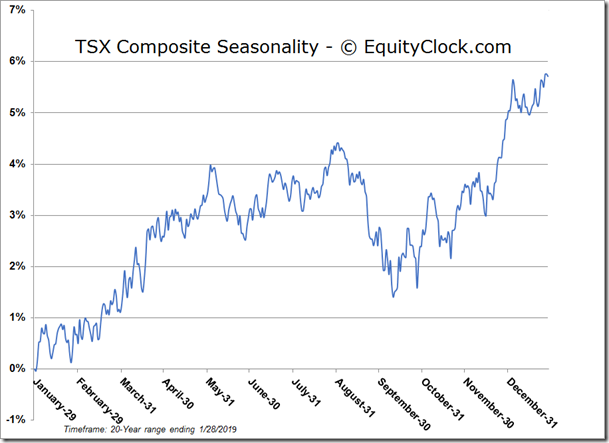 There is much debate at the present juncture about whether we are starting a new bull market trend or remain in a bear market pattern. 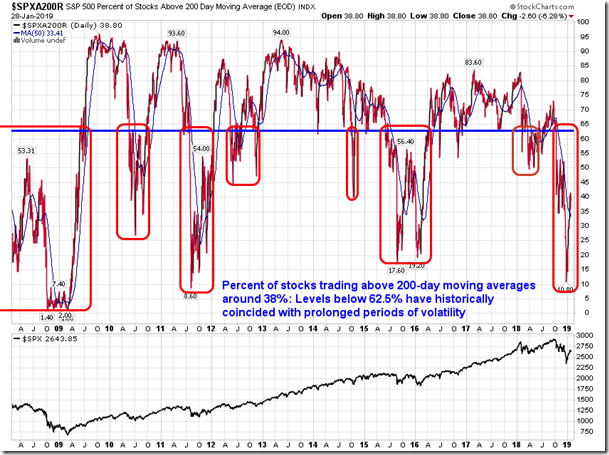 A simple look at the percent of stocks in the S&P 500 Index trading above 200-day moving averages provides an unbiased answer. 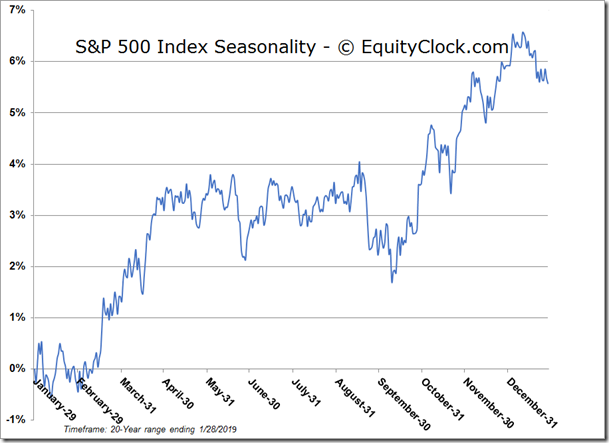 When the percent is below 62.5%, periods of prolonged volatility and weakness have typically followed, implying a bear market trend. 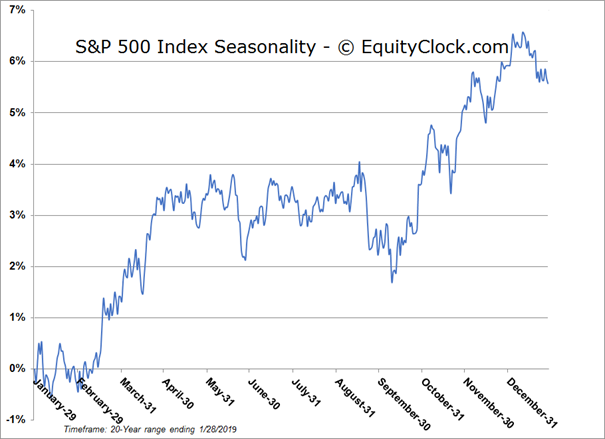 Conversely, sustained bull market moves have coincided with the indicator moving above 62.5, implying about two-thirds of stocks are trading above their long-term moving average. 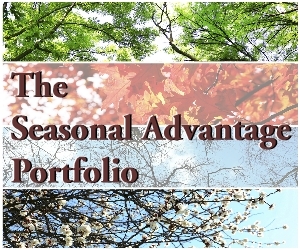 When a large percentage of stocks are below this hurdle, it creates a cap on market momentum and investors are better off taking advantage of short-term sell signals in order to mitigate the volatility in portfolio positions. 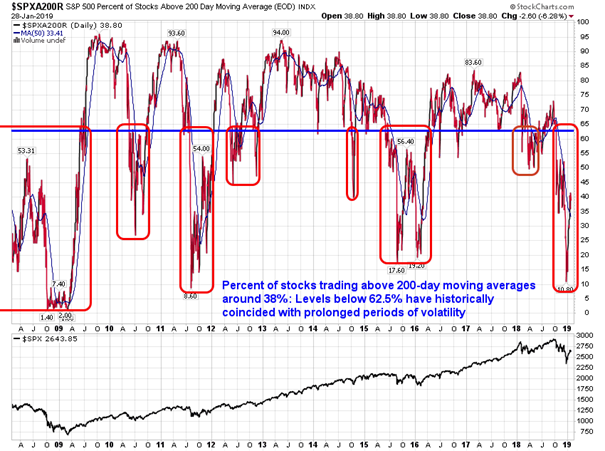 The percent of stocks trading above 200-day moving averages presently sits at 38.8% after Monday’s session. 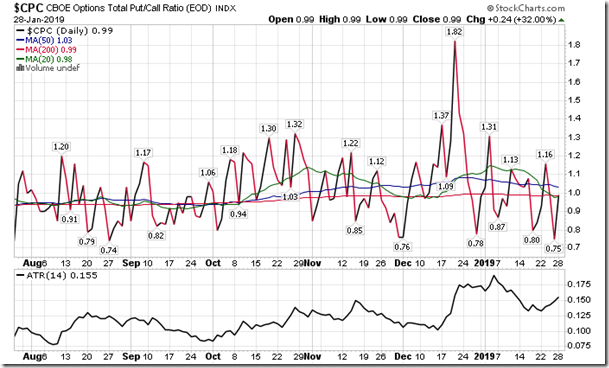 Sentiment on Monday, as gauged by the put-call ratio, ended close to neutral at 0.99.